The Wagga Wagga Agricultural Institute (WWAI) is the New South Wales Department of Primary Industries (NSW DPI) Centre of Excellence for Southern Farming Systems and Viticulture. WWAI is located on 900 hectares 10 kilometres north-west of Wagga Wagga on the western side of the great Diving Range where the slopes merge into the plains. It is on the edge of the sheep-wheat mixed farming belt and in the midst of a productive horticultural region. Mixed farming in southern NSW consists of approximately 60% winter cropping (mainly wheat) and 40% livestock (mainly sheep). As an industry it employs approximately 8,000 people, and produces around 15% of the national agricultural output with a farm gate value of approximately $5.2 billion. The NSW wine grape industry constitutes about 20% of the horticultural activities in the region, employs approximately 1,200 people, and produces about 25% of the national output with a farm gate value of approximately $270 million. As such, WWAI through industry-driven research, extension and regulatory services aims to improve the profitability and competitiveness of mixed farming systems in southern NSW and the State's expanding viticulture industry in ways that protect the natural resource base and assist farmers adapt to climate change and variability. WWAI conducts major programs in Farming Practices and Agronomy; Crop Germplasm Development and Variety Evaluation; Crop Protection; Pastures; Beef Production Animal Nutrition; Weed Science; Entomology; Vine Management; Natural Resource Management; Cereal Science and Oil Science. WWAI is also a key partner in two major alliances: the Graham Centre for Agricultural Innovation; and the National Wine and Grape Industry Centre. The Wagga Wagga Agricultural Institute is situated on 893 hectares of land suitable for winter field crop research with a temperate climate and average rainfall of around 600 mm. The land is run as 5 mini farms (farmlets) each with their own crop/pasture rotation that allows paddocks to be “set up” in terms of soil fertility and weed burdens for the research group that will be using them in any one year. 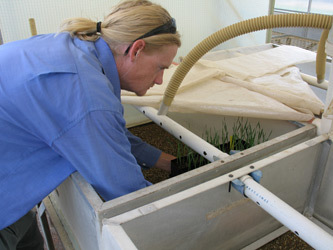 For example, if one of the research sections requires paddocks to have a certain soil nitrogen status this need is met by rotating crops across the paddocks within a “farmlet” in the previous years to use or add soil nitrogen so that it is at the desired level in the target paddock in the year that the new wheat lines need to be grown. Although primarily managed to facilitate a large number of field-based research programs, the Institute also conducts commercial winter cereal cropping and prime lamb production enterprises. Irrigation water is available under license from the Murrumbidgee River, and is used in both flood and overhead applications. Two modern training laboratories located at the Wine and Food Industry Training Centre. The Institute has world class accreditation for its laboratories and facilities (NATA and/or ISO9001:2008 Certification). A modern Animal Nutrition Facility is located at the Institute, enabling intensive studies to be conducted on ruminant feeds (hay, grain, silage or mixed rations) using either sheep or cattle. Institute staff have access to soil and agronomy facilities such as a number of new glasshouses, including one that is to PC2 standard, dehydrators for plant and soil samples, growth cabinets, seed cleaning and grading equipment, a fleet of tractors, seeding equipment, small plot harvesters for field trials and a small research library. The Institute also has conference and meeting room facilities, and hosts a number of small and large industry-based meetings annually. Collects agronomic research data for new wheat, canola, and pulse varieties that will be synthesised into management packages for the south-eastern Australian cropping region. Provides the research, demonstration, advice and development required to encourage best management practice for southern NSW mixed farming. Current focus is on improvement of the feed base and reduction of the winter feed gap through inclusion of perennial grasses, weed and disease management and risk management of climate change and variability. Working in conjunction with canola, barley, wheat and pulse breeding organisations to develop germplasm and evaluate cereal, oilseed and pulse varieties for production suitability to southern NSW. Conducts the plant pathology and entomology research, demonstration and advice relating to pests and diseases that limit yield and quality of crops and pastures in southern NSW. The entomology section also has a strong focus on grain storage management and monitoring chemical resistance in grain storage insects. Develops growth prediction models for beef; assesses cereal forage, hay and silage quality; and is investigating the use of silage in production feeding systems to improve the content of omega-3 polyunsaturated fatty acids in meat. Scientists conduct research on genome analysis of crop plants, and DNA barcoding to understand complexity of biological processes and identification of agriculturally important insects, exotic arthropod pests and invasive weeds. The National Wine & Grape Industry Centre (NWGIC), which supports the Australian wine and grape industry is a collaborative venture between NSW DPI, Charles Sturt University and the NSW Wine Industry Association. The NWGIC aims to support development of consumer-preferred, Australian regional wine styles that will increase demand and added value of Australian wine. Integrates research, development and advice into training modules and management packages that ensure agriculture provides appropriate stewardship of the environment and natural resource base. Training modules for landholders have been developed on soil biology, soil management, salinity management, irrigation and water use, climate risk. First class ISO certified laboratory facilities for wheat and barley quality assessment and end-product evaluation of various breads, noodles, steamed products, biscuits, and barley malt quality. The Australian Oil Research Laboratory (AORL) at WWAI is a world class accredited facility conducting research into the composition and organoleptic properties of olive oils and canola traits and has made a significant contribution to the high quality of Australian products. Conducts a range of programs to ensure the risk of animal and plant disease and pest incursion to southern NSW agriculture is minimised including monitoring, compliance and emergency management response. Feed testing is an integral part of good animal nutritional management to achieve the best and most profitable results. The Feed Quality Service (FQS) offers a comprehensive commercial testing service for the analysis of animal feed including hay, silage and grain, mixed feeds and total mixed rations, pastures and forages. The service is based on the latest technology and extensive research by some of NSW leading scientists. 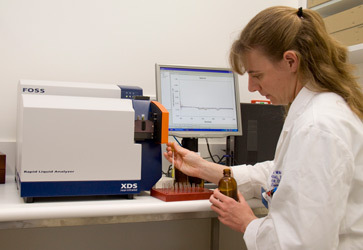 The FQS is the only facility in Australia that operates a laboratory which integrates research and commercial feed testing. The Oil Testing Service (OTS) offers a comprehensive commercial laboratory testing service for the analysis of olive oil, olive fruit, oilseeds and edible oils including an olive oil organoleptic sensory panel. The service is based on the latest technology and requirements of national and international standards including those set by the International Olive Council (IOC), American Oil Chemists Society (AOCS) and the Australian Oilseeds Federation (AOF). The laboratory also provides all testing requirements in determining if olive oil meets the Australian Standard AS5264 as well as export standards for China and the United States. review of planning proposals, rural land strategies and local environment plans to ensure protection of agricultural and the natural resources it relies on. Provides an animal health service in the region by participating in national state and regional animal health programs, undertaking disease surveillance, delivering training for emergency disease preparedness and response, and assisting the LLS, RSPCA and other agencies in animal welfare matters. Tocal College, the Registered Training Organisation (RTO) of NSW Department of Primary Industries has staff located at Wagga to ensure accredited training opportunities are available to DPI staff and clients in the southern regions of NSW. Chemical training is always available and recently there has been an emphasis on safety courses particularly for Quad Bikes. The Wagga Wagga Agricultural Institute (WWAI) has a long and distinguished history in agricultural research. Agricultural research commenced at Wagga Wagga in 1892 when the Department of Agriculture established an Experimental Farm on the site. Nathan Cobb planted the first trial of more than 200 wheat varieties in 1893. Cobb, a plant pathologist at Wagga, worked with the wheat breeder William Farrer, who was located at ”Lambrigg”, near Queanbeyan. From 1896, the Wagga site was also educating farmers at the Experiment Farm School. Farrer joined the Department in 1898, working mainly at Wagga but also at Cowra and other experiment farms. 1901 saw the release of his most famous wheat variety, Federation. Farrer’s early maturing wheats enabled a rapid expansion of wheat growing in Australia. Farrer was followed by other cereal breeders, notably Pridham, working from Cowra and assisted at Wagga by Robert Hurst. The Second World War interrupted efforts to combine baking quality with disease resistance and high yield. When Eddie Graham was appointed Minister for Agriculture in 1944, he indicated that a Wheat Research Institute should be established in the wheat belt. He appointed a Wheat Research Institute Advisory Committee of farmers, millers, bakers, shippers, Dr S Macindoe from the Department and Professor Waterhouse from the University of Sydney. In 1945, a proposal was submitted by Dr Macindoe for the establishment of a Wheat Research Institute to address the breeding of rust resistant wheat varieties with superior baking quality. In 1950 the Foundation Stone for the Wheat Research Institute was laid opposite the buildings for the Wagga Agricultural College, opened in 1949. The founding director, Dr Albert Pugsley, was appointed on 1 July 1953 and the first research staff in agronomy, plant breeding and plant pathology in August that year. The official opening of the Agricultural Research Institute (ARI) took place in October 1954 and by the end of 1955 the staff had grown to 17 including people in cereal chemistry, soil chemistry and general chemistry, a weeds agronomist, an assistant who later became the laboratory craftsman, one farm hand and office staff. Two of the first group of appointees were Ron Martin, long time wheat breeder, and Dr Fred Mengersen, oat breeder, both located at Temora. These breeders were already employees of the Department of Agriculture prior to 1953. Temora Experiment Station has continued to be a part of the Institute since that time. The ARI was run as an autonomous institute under Dr Pugsley, with the College responsible for farm management and assisting with staff matters. The ARI’s role continued to expand and collaboration with CSIRO led to some of their staff in pasture research being located at the Institute. The library wing (B Block) was built in 1965. Les Bird, cereal chemist, and following him, Dr Allan Smith, soils chemist, took on the role of deputy/associate director. The early 1970s saw research broadened into crops such as barley, canola and pulses. The first manager was appointed in 1973. Dr Pugsley retired in 1975 and was succeeded by Dr Smith. In 1976, the Agricultural College became part of Riverina College of Advanced Education, the forerunner to Charles Sturt University. The farm was split and separate administrative arrangements made. The Conference Room wing (D Block) was opened in 1979. In 1981, the Department was decentralised into regions, and in 1992 it restructured again and became program-based. Research expanded into new areas, such as ruminant nutrition; the animal house opened in 1985. The National Wine and Grape Industry Centre was formed by Charles Sturt University, NSW Wine Industry Association and NSW Agriculture in 1997. When the local advisory and regulatory staff moved to the site in 1998, the Institute was renamed Wagga Wagga Agricultural Institute, a Centre of Excellence for Southern Farming Systems and Viticulture. In 2004, NSW Agriculture has become part of the NSW Department of Primary Industries and the Institute and Charles Sturt University have formed an alliance called the Wagga Wagga Agricultural Innovation Park. Wagga Wagga became the Centre of Excellence for Southern Farming Systems and Viticulture in 1998. Weather records have been collected at the Wagga Wagga Agricultural Institute (elevation 214m above sea level) for over 100 years, and the Institute is an important second local recording site for the Bureau of Meteorology. Data recorded shows that over the past 100 years, there has been a gradual, but steady, increase in average annual rainfall from 480mm in the early part of the 20th century, to the current average of 580mm. Rainfall distribution across the year, on average, is relatively even at 48 mm/month, even during the summer months. The climate can best be described as temperate, with hot dry summers and cold winters. Mean daily maximum temperatures range from 12.5ºC in July to 31.2ºC in January. Summer temperatures can regularly approach, or exceed, 40ºC [ for up to a week at a time. Mean daily minimum temperatures range from 2.7ºC in July to 16.2ºC in February, with many frosts occurring during the winter months.